What's the Story With the Christmas Pickle? A lovely tradition from Germany is the bride's tree. It is believed that a married couple's Christmas tree needs 12 specific ornaments for happiness in their life journey together. These ornaments are often given as a wedding gift or a Christmas gift for the newlyweds. Each ornament symbolizes a different hope or blessing for the new couple. 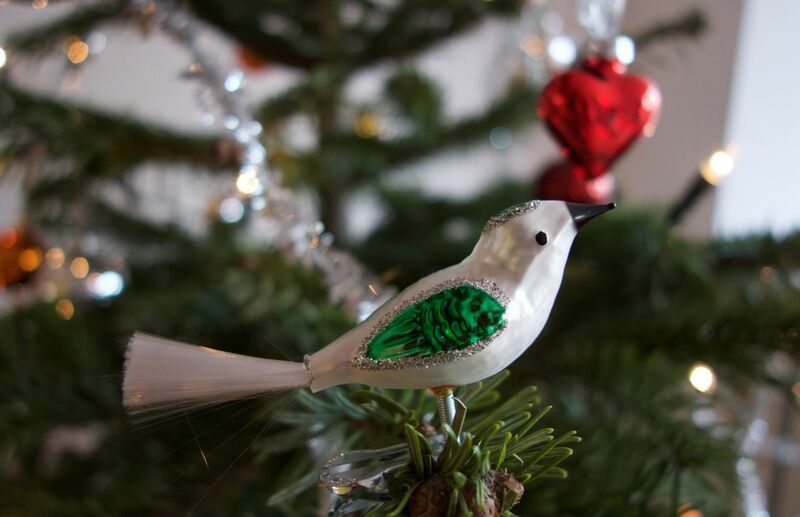 You can find a lovely bride's tree ornament collection on Amazon. Or you can shop for each ornament individually. Around Christmas, many seasonal shops sell a large variety of ornaments. Websites like Etsy and eBay are also great places to look for unique ornaments. If you plan to order online, make sure to start your shopping well before the holiday rush to avoid shipping delays. Fish: A fish, symbolic of Jesus Christ, represents Christ's blessing, as well as fertility. Teapot: Inviting a guest for tea is a nice way to demonstrate your hospitality. Bird: A bird, more specifically, a dove represents the Holy Spirit. It symbolizes joy and happiness. If the bird is in a nest, then it represents confidence in the cottage or home. Angel or church: This is a symbol of God's guidance. Rabbit: A rabbit stands for hope and peace with nature. Fruit basket: Like a cornucopia during Thanksgiving, a fruit basket represents generosity and plenty. Heart: As you might expect, a heart is a symbol of true love and love in the home. Pine cone: A pine cone, an evergreen symbol, represents fruitfulness, eternity, motherhood, and fertility. Flower basket: A flower basket or bouquet symbolizes good wishes or beauty in the home. Rose: The rose is a symbol of affection and the Virgin Mary. A yellow rose symbolizes faithfulness in marriage. House: Pretty much self-explanatory, a house represents a family's shelter or protection. Santa: Annually, Santa Claus is a symbol of goodwill, giving, and sharing. Glass carrots: Carrots were believed to bring the bride good luck in the kitchen. Star: Like the star the led the Three Wise Men to Bethlehem, the star symbolizes guidance. Boat: This is representative of a couple sailing across the waters of life, both rough and smooth. Colored balls: The many colors symbolize the diversity of the world. Paper chains or garlands: These strands are symbolic of how humans are all bound together. Lights: In Christian tradition, candles are a symbol for Jesus and the light he brings to earth (and a couple) even in the darkest times. Grape: Like the Communion wine that brings people together, grapes are a symbol of friendship. Bell: A bell, usually wrung to mark a momentous time, represents joy and merriment. Another fun Christmas tradition involving an ornament is the Christmas pickle. This tradition was said to have been imported from Germany, although, there is much debate whether this is a German tradition or an American-made tradition. According to the story, the glass pickle should be the last ornament hung on the tree. On Christmas Eve, parents are supposed to hide the pickle somewhere on the tree. The child who discovers the pickle ornament would receive a special gift from St. Nicholas for being so observant. Finding the pickle is also thought to be a sign of good luck to come in the new year. While this tradition has gone out of fashion in Germany (with uncertainty whether this is an actual German export), Americans are keeping it alive. Berrien Springs, Michigan, is known as the Christmas pickle capital of the world. For many years it held an annual pickle parade and festival. It should be no surprise that the town is also known for its cucumber production.